Marie Anne Cope was born in Marlow, in the UK. She has worked as a salesperson and a banker, before eventually training as an accountant, working for over a decade in practice and industry before setting up her own business. Marie is also a yoga teacher. She is presently writing three series. 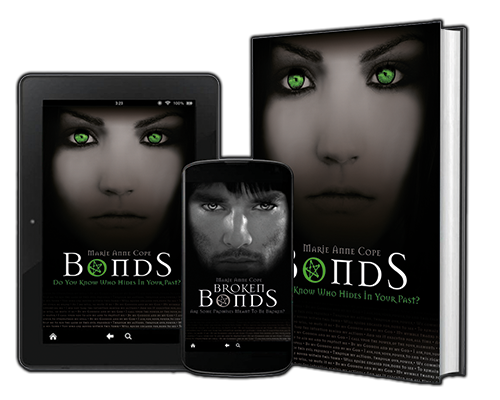 The BONDS series is set in both the 17th century and the modern day and follows the unusual relationship between Becca Martin and Antony Cardover. Becca is forced to face up to birthright as a witch in order to survive and help Antony in his quest to break his vampire curse. THE MISFITS follows the adventures of four supernatural friends – Achoo, Mina, Boo and Zoe – who are all failing at being what their parents and teachers expect them to be. During their adventures, they learn that being different, being unique, is not just okay, it’s perfect, as they help others in need along the way. TALES FROM A SCARYGIRL are collections of short horror stories which not only seek to explore what lies beyond the veil that separates this world from the next, but also what darkness lies deep within us, waiting for the opportunity to escape! Marie loves hearing from readers, so please feel free to contact her using the form on the contact page.